When Oprah Winfrey, stressed from the launch of OWN, called on her good pal Tyler Perry, he offered two new TV shows. Here, the media moguls spoke with ESSENCE exclusively about personal power, how to handle criticism (even from Black folks) and why they aren’t worried about mixing business with friendship. This is one issue of Essence I might buy. I'm still on the fence about Tyler new shows for OWN. I'll give them a try, but I ain't promising nothing. 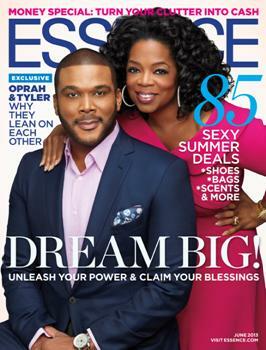 The June issue of Essence hits newstands May 10th. I'm glad the two of them are partnering with each other. I hope the shows prove to be successful. The one clip I saw seemed soap opera-esque. But I am hoping for the best!